I found "Simply Speakers" on Google. Also watched a YouTube video of a speaker repair. It looked too simple and at first I doubted it. I had some questions and called tech support to make sure I was selecting the right kit and some specific questions about how my speaker looked a little different than what I had seen on the internet. Support was outstanding. I received the kit a few days after ordering and (following the directions)repaired my speaker the same day. There were no problems at all. The repair went just as described and it is just like new. Great Product and Great customer service. These kits are well made and work well. The repair should result in the speaker becoming "as new" if directions are followed. However, be careful to make sure enough adhesive is used on the cone itself. 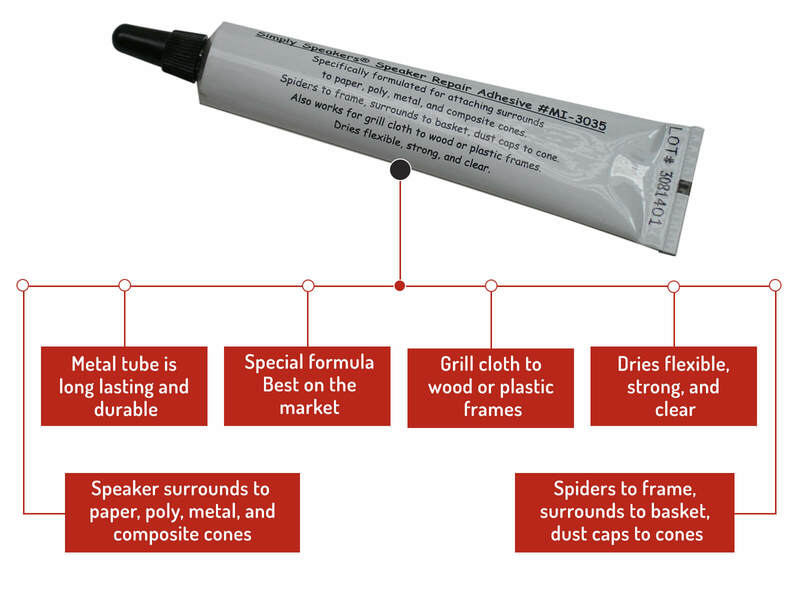 Too little adhesive can result in the surround detaching from the cone and causing rattles etc. If this happens the opened area CAN be re-glued but results in a messy job. Excellent instructions and support, worked perfect on my speakers and sound like new. The video was very helpful. The product was perfect for salvaging a pair of 30 year old Advent Maestro speakers. Customer service responded quickly, ensuring I was purchasing the correct repair kit for my speakers. I was thankful to find this repair for my speakers. The video and instructions were very helpful. I am very pleased with the product that was provided & my speakers sound great again! Install the forms according to the websites teaching videos. Worked absolutely perfectly! Advent speakers sound good as new! The foam replacement parts worked like a charm. Fit perfect and the sound "GREAT" Thanks to the team at Simply Speakers for helping me get the "Right Stuff"
Easy ordering, excellent service, quick shipment! Over-all a very pleasant experience working with Simply Speakers and would highly recommend them. 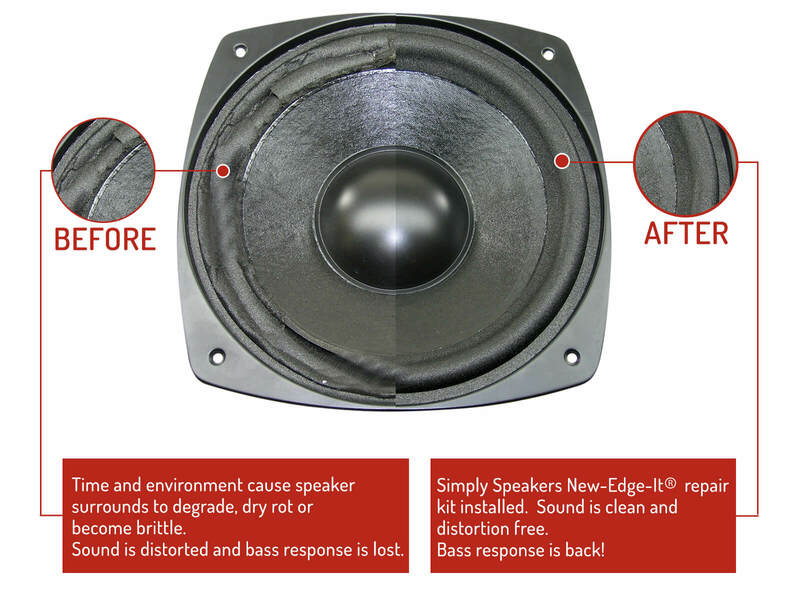 They helped me find the right product, had easy instructions and clear YouTube videos for helping with repairing my speakers. Thank you!! Excellent product with easy to follow directions. I initially ordered the wrong part number so I contacted the company via email to inform of my error and Simply Speakers representative corrected my order without any delay and foam surround kit was delivered two days early. This is the only company I use for reforming speakers. 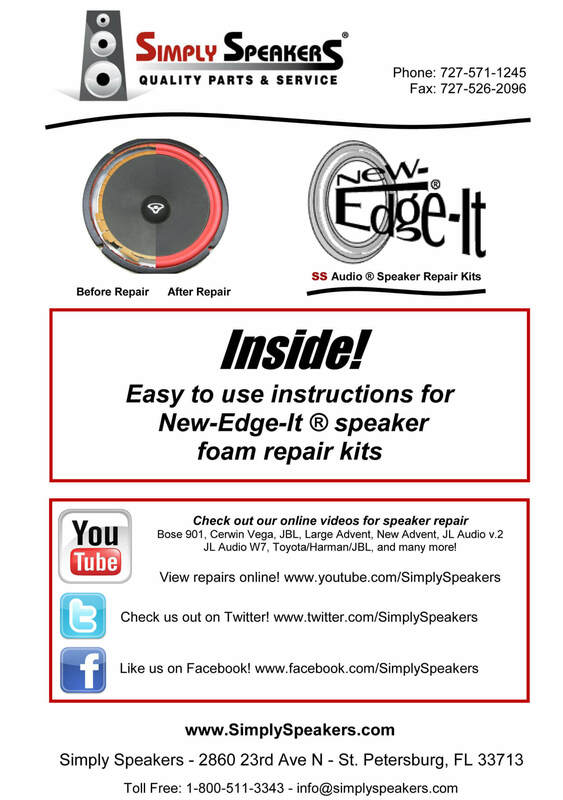 I highly recommend Simply Speakers for all your speaker replacement needs. 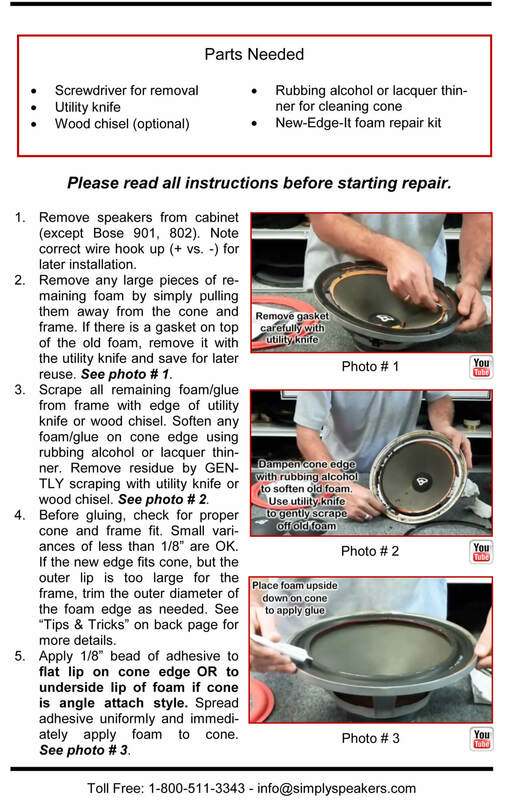 Purchased this foam kit to repair my very old Advent speakers. After watching the video clip on how to remove the old foam and install the new one I was able to repair my speakers to like new condition. It took me longer to remove the old foam than in the video but that was because I was being cautious so as not to break the cone. I enjoyed the repair and they sound great. I should have done this a few years ago. Q: Is this the right kit for Advent Legacy II speakers--10" woofer model number is 2203200? A: Yes! This is the correct kit for the Legacy II. Thanks! A: This kit will fit the Advent Legacy, but not all other Advent models. For other models, you may need the FSK-10AD. A: No, please order kit # FSK-10AD for your model. 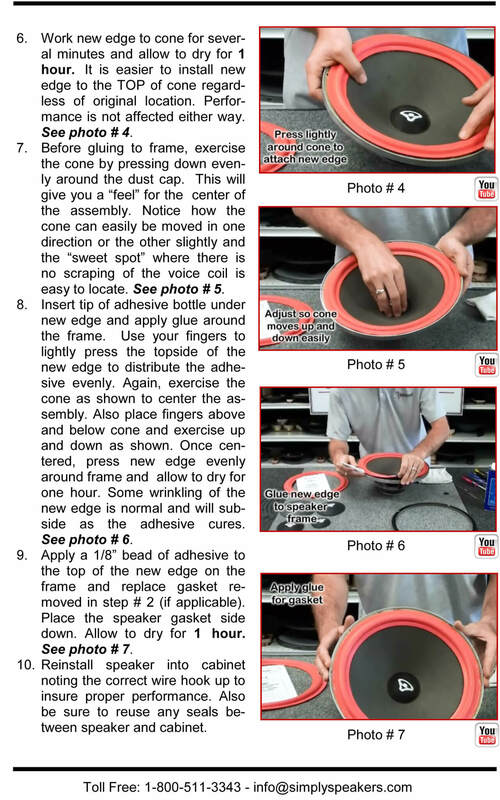 You can find it easily on our Advent speaker parts page. Q: My advent 10" has a cardboard type ring on the top outer edge. Does this have to be removed to install the foam? A: If your Advent has a completely round 10" frame with a cardboard gasket it must be removed first. 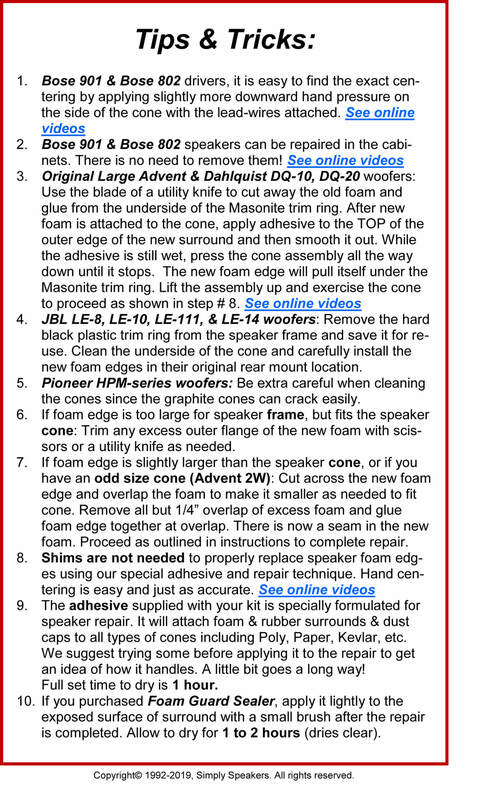 Please do not remove the wide Masonite trim round on The Advent Loudspeaker and The Large Advent Loudspeaker. 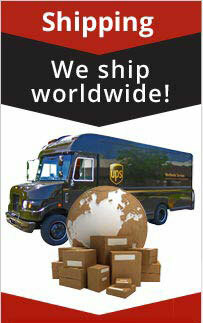 Please contact us with a photo if you are unsure what model you have. Q: I have 4 advent spkrs the woofer part it self is about 8 inches the over all is 11 1/2 frame. What size repair kit do I need 10 or 12? Also 3 of the 4 advents which are all the same model number have 3 metal frame woofers and one has masonite. A: You need to order Advent kit # FSK-10AD for your version. The FSK-10A fits other models, but not the 11.5" frames. Thanks! 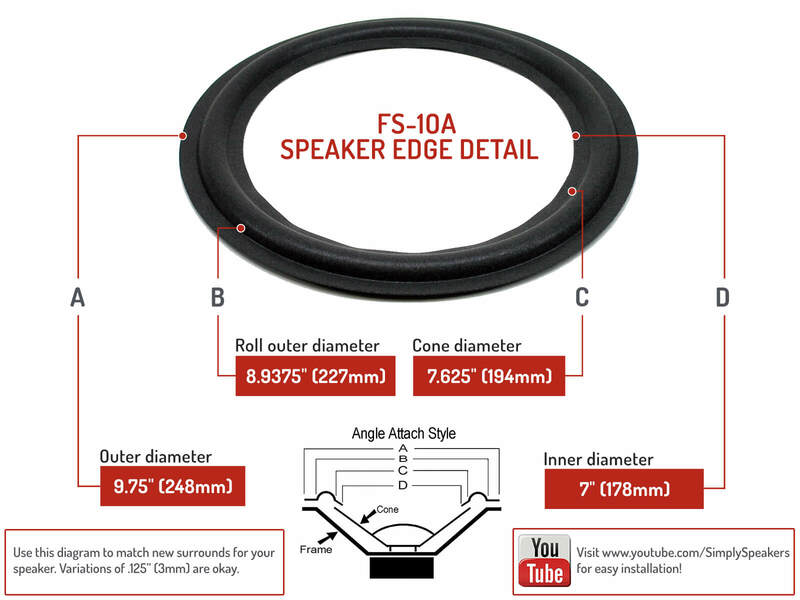 Q: what is better, foam edge, or rubber edge, for replacing on Advent speaker? A: Foam is the best choice for sound quality. Keep in mind that the new material used for the foam is superior to the old. Q: Hi. I have Advent Maestro 3-way Model A-1012 speakers. Is this the correct foam repair kit (FSK-10A)? Or do I need the FSK-10AD? Thanks so much! A: Thank you. This is the correct kit for the Maestro. Part # FSK-10A. A: Please order Advent foam replacement kit # FSK-10AD for your model. Q: Good morning, I need to repair my woofer speakers Advent and saw your repair kit. Can you tell me which kit I have to order? mine are the Advent loudspeaker purchased new in 1980 and I measured the diameter of the woofer which is about 24 cm. waiting for your response, best regards. A: Please order kit # FSK-10AD for your Advent model. Q: my 10 inch advents have a cardboard gasket at the edge of the rottin surounds as i thought most speakers do,to fix you need to remove that right? A: Yes, this gasket must be removed to replace the foam. 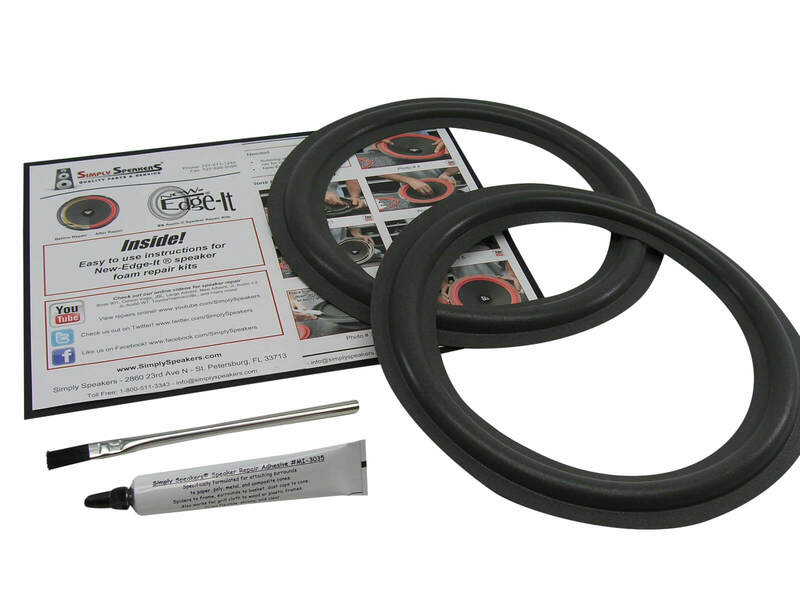 We also sell new gaskets part # GAS-10 if you need them. Thanks! 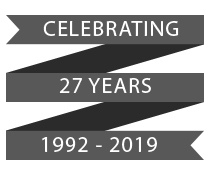 Advent: Legacy, Legacy II, Legacy III, Maestro, 25013, 6003, 6300, 2200853, 2201666, 2202414, 2208538, 2202873, 2208551, 2208640, 2208701, 2208707, 2208719, 2208720, 2208736, 2208738, 2208750, 2208804, 2208919, 25159, A-1010, A1010, A-1099, A1099, Powered Sub, PS-10, PS10, 85A-26, and many more!